When I first started thinking about actually going to Olympics – when I pictured an Olympian, in my mind I saw a male swimmer. He was sort of a perfect specimen – tall, broad-shouldered-narrow-waisted, hairless (?ha! ), and almost zero fat on his body. I am none of these things so how could I become an Olympian? But “he” was the example that our culture kept feeding me. While Canadian women did win medals, male champions tended to be lionized. Sport is one of many fields where coverage of it is skewed towards the male bias whether the field is male dominated or not. 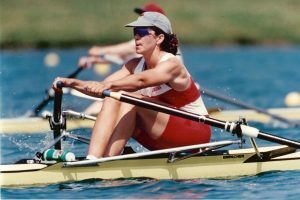 In rowing it was even harder to picture role models that I could identify with. It wasn’t just Canadians that struggled to win gold medals; it was ALL western nations. What I wanted to do hadn’t been done by someone like me…yet. I progressed to a level where I would be racing at the Olympics – I was actually going to be an Olympian and we had a chance to be on the podium. When I got to the part in my mental imagery where I heard the national anthems – I always heard the American anthem first. I think this is because at every sporting event I’d been to in Toronto, the US anthem was played first and then our Canadian anthem. Regardless of the reason – there was a pattern in my mind where I wasn’t the one on the top of the podium and that’s a problem when your goal is to win. If I wanted to be a champion, I had to first work to see myself as a champion. I had to develop my ego, which is to say I had to learn to believe in me. As a young ambitious athlete I dreamed being a champion and until I knew what to do, it would stay just a hazy dream. I didn’t even know where to start. I didn’t know who I could emulate, but I had a good idea of what this person would do; a champion would be great at their task. When I began to put myself into my minds-eye as a champion I started with what I wanted to DO, not what (who) I wanted to be. My dream turned into a clear goal. Task. Technique/Skill. Strength. These are the elements that I used to change the image in my head, to develop my ego. As I did, I progressed and matured from a young aspiring athlete into an experienced performer and gradually became a confident, talented, strong postured, secret-knowing champion not just in my own mind – but for other to see too. As long as I was focusing on my task by improving my technique and strength I was on an up-curve in my career. I could legitimately picture myself as a champion. Believing in me wasn’t about who I was — my ego, and success — came from believing in what I could do. (psst… that is the secret!) But a career is long, whenever I fell into the trap of feeling that I’d done enough, or that it was ‘my turn’ for success, my performance would suffer. I might have been thinking that I was still a current champion, but my technique, skill and strength weren’t current and certainly weren’t world leading at those times. Resting on my laurels of previous seasons led to a sense of entitlement and arrogance, which also resulted in the stalling of my progression. (And with colleagues and competitors always improving – a stall is effectively moving backwards.) These phases would last until I smartened up – and got back to improving my task through new and improved technique and skill. Thankfully I had great and encouraging leadership (coaching) and colleagues (team mates) and we all (most of the time) thrived on curiosity, change and improvement. In hindsight, I can tell you that even after I retired (well after I retired if I’m honest!) if you asked me to picture a champion I would still see myself. The problem is… I did for way longer than I should have. I continued to picture myself as current rowing champion, and while I may still have great technique my skills and strength were/are out of date. I remain extremely proud of the quality of my career, but it’s important for me to remember that long ago I finished improving on my task. For a veteran in any field, how they do or don’t continue to hone their task defines what kind of veteran they are. Champion or… dinosaur. Do they continue to earn their positive vision of themselves and their performance, or are they stringing along an outdated legacy. In a future blog I’m going to explore some examples of veterans – champions – who continue to grow by seeking change and challenge. This entry was posted in Mentor Messages, What I'm thinking (Thoughts and opinions) and tagged career champion, ego v arrogance, performance by Marnie. Bookmark the permalink. Remarkable insight, thank you so much!